A Traveller and Tourists Guide to the Aberdeen-Inverness Line. 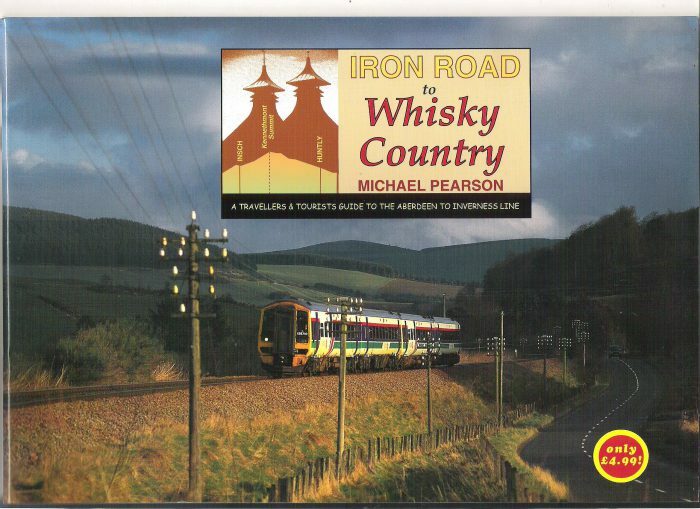 Iron Roads to Whisky Country is a colourful coffee-table guide book to one of Scotland’s top scenic rail lines which is often overlooked; the ex-Great North of Scotland route from Aberdeen to Inverness. Running through rolling hills and open farmland by the Moray Coast towards the Beauly Firth, the line is one of the last ‘traditional’ railways, still controlled by mechanical signal boxes with Victorian brass tokens exchanged from signalman to driver. Huntly, Keith and Elgin are among the delightful rural stations, as well as Forres, where the GNSR originally joined the Highland Railway from Aviemore. Michael Pearson’s razor-sharp wit is at its best as he describes the route and scenery in great detail, with maps included, making it an ideal companion for anyone travelling on the line. Large colour photos show a variety of ScotRail trains at work.